Consumer confusion reigns over digital TV switchover | What Hi-Fi? A parliamentary report has found that many viewers do not understand the implications of the digital switchover, despite a £200m ad campaign. It says the 'digital tick' labelling scheme used on TVs with built-in Freeview receivers remains a mystery to sales staff and shoppers. Nearly half of all TV sets sold in the first six months of 2007 were analogue. Committee chairman Edward Leigh said: "Many viewers do not seem fully to understand the implications of the analogue switchoff and are still buying analogue TVs – unaware that they have built-in obsolescence. "The evidence is that the digital tick label, with which digital TVs are labelled in shops, is a mystery to many retail staff, let alone the people to whom they sell TVs." He added that just 15 per cent of households needed to make the switch to digital for their main TVs, but that left 26 million analogue TVs to be converted or replaced. The Government claims 87 per cent of UK homes now have access to digital TV. 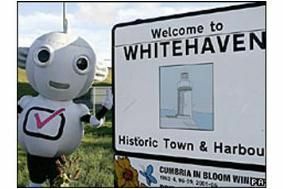 Whitehaven in Cumbria was the first town to have its analogue signal switched off last October.